This is going to sound strange coming from an ex-recruiter but don’t let your LinkedIn profile read like a résumé. Many people think LinkedIn is site to showcase your resume and search for job opportunities, but it’s a lot more. It’s your opportunity to build your professional brand. I was a reasonably early adopter (in Ireland) and the first iteration of my profile was basically a copy and paste of my résumé. Over time I’ve learned that what I needed to do is move away from thinking of my profile as my résumé and start to think of it as my online reputation and brand. If you Google yourself, what’s the first link that appears? Nine times out of ten it’s your LinkedIn profile that will come top of the search results. Ask yourself “what does my LinkedIn profile say about me? Does it give my prospects and customers the impression that I am a competent professional, knowledgeable in my industry and can help solve a business problem or create value?” If it doesn’t then perhaps it’s time for a change. Here’s my advice on how you can turn your online résumé into something far more powerful (and yes, recruiters will still be able to find you!). Did you know that there are 45 million profile views every day on LinkedIn and you are 11 times more likely to have your profile viewed if you have a picture? One sure way of being ignored is to omit a photo. Think about the last time you went house / flat hunting on the web. Did you click through to any properties where there was no picture? When you do add a photo, don’t be tempted to post one of a night out in the pub, scuba diving or holding a baby (even a very cute baby).A simple headshot set against a neutral background, looking approachable and smartly dressed is perfect. It doesn’t have to be professionally taken, but it should look professional. Also, profiles with photos receive a 40% high InMail response rather because people like to see who they’re speaking to. The first thing people read (after they’ve looked at your profile picture) is the headline. This appears directly under your name and if you haven’t customised it, it will have defaulted to your current job title. Why not stand out from the crowd a little? You can edit your headline and include up to 120 characters. My advice is to add your job title, current company and a tagline about how you help customers. Here are two of my colleagues who have done just that: Jochem Verbunt and Shannon Kato. Your summary in essence the ‘story of you’ and again the key is to think of your audience when you write it. Try to avoid bullet points, make your summary more conversational. I recommend writing it in the first person and keep it relatively short, 3 – 4 paragraphs at most. To make yourself more easily found, include several keywords relating to your industry. That way you will surface more easily in searches. You should give the viewer an insight into how you got to where you are today, what you currently do and if you have an example of how you’ve helped a customer it’s a great idea to include it here. It’s OK to inject a little bit of personality and passion. I love my colleague, Carmen Pop’s profile summary as you really get a sense of her personality when you read it. If you are in sales, don’t be tempted to highlight that you crushed your sales targets year over year in your summary as it may scare off prospective customers. Instead move this to the “Honours and Awards” section. Finally, if you feel comfortable, add a call to action. Invite the viewer to get in touch with you and be specific as to how they can do that. Including your contact details might result in a direct inbound lead. Turn your profile into a mini marketing platform for your services or solutions by adding presentations, videos or whitepapers. You can add media beneath your summary or any of your experience. Before you start to make sweeping changes to your LinkedIn profile, you may want to adjust your privacy settings first and switch off updates to your network every time you make a change. To do this, simply click on the thumbnail photo on the top right of your home page, select “Privacy & Settings” and then under Privacy Controls click on “Turn on/off your activity broadcasts”. These are just a few pointers to get you started so you can really optimise your profile. 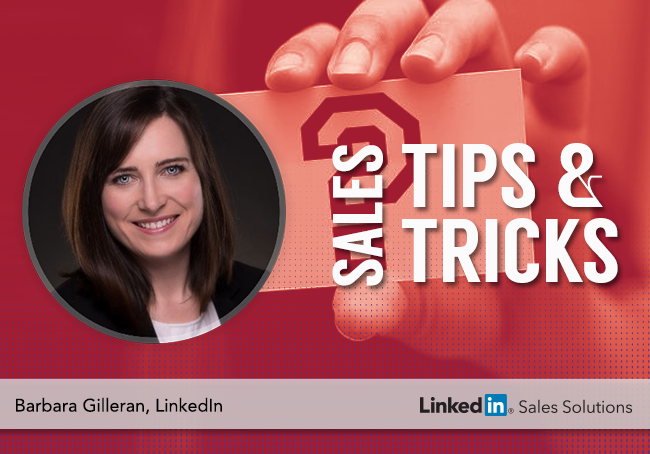 For more tips download our Build your Sales Profile tip sheet, which has been especially created with sales professionals in mind or join me for a live Webinar on 25 September at 16:00 GMT / 08:00 PST called Transform Your Profile. Click here to register.